It's beginning to look like The Conners will be returning for season 2. 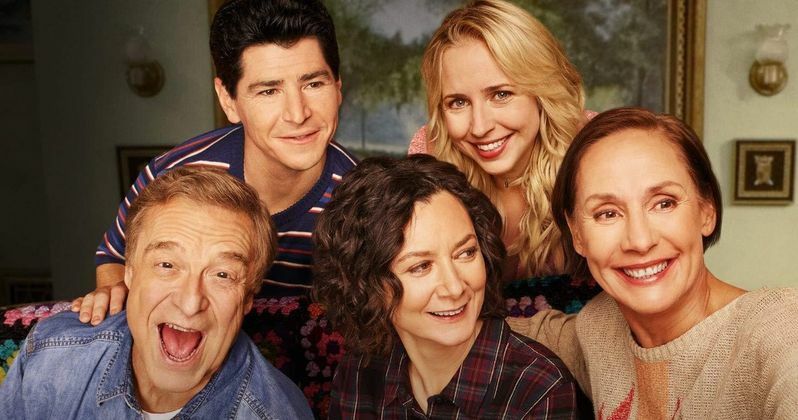 John Goodman, Laurie Metcalf, and Sara Gilbert are all reportedly close to signing their deals to bring the Roseanne spin-off series back. The first season was ABC's highest-rated new comedy series of the 2018-2019 season and ABC Entertainment president Karey Burke revealed earlier this year that the network was close to a deal for the Season 2 renewal. The Conners season 2 is set to have 13 episodes instead of the 11 that we were treated with for the first season. It is also believed that showrunner Bruce Helford has already been working on story ideas for one of America's favorite TV families. It is believed that Sara Gilbert, John Goodman, and Laurie Metcalf will each make around $375,000 an episode, which sounds about right. The show also features original Roseanne cast members Lecy Goranson and Michael Fishman along with newcomers Maya Lynne Robinson, Emma Kenney, Ames McNamara, and Jayden Rey. Roseanne Barr recently made a return to the world of stand-up comedy at the Laugh Factory in Las Vegas with Andrew Dice Clay. Barr ripped into ABC for firing her from her own show "at the first sign of controversy." The actress/comedian was famously fired from the show after she posted a racist tweet about former Obama senior advisor Valerie Jarret. The massively successful Roseanne revival series was immediately canceled, which paved the way for The Conners. While not as big as the former revival series, the new show has been able to stay on top of the ratings and averaged a 2.3 rating among adults aged 18-49 for its initial 11-episode run. The Conners made the difficult decision to kill off Roseanne Barr's character with a drug overdose. The groundwork had already been set at the end of the Roseanne revival series and it was almost like Barr knew in some weird way that everything wasn't going to work out. The drug overdose was controversial, but it was also perfectly set up at the same time. Barr ripped into ABC for killing her off after she delivered some really great ratings during her recent profanity-laced stand-up appearance. While Barr is gone from the show, the rest of the cast has done a great job carry on the spirit of the original. The Conners Season 2 confirmation should come any day now, as long as the contract negotiations end up going smooth. Roseanne fans, for the most part, are invested in these characters and they want to see more of them, so ABC knows that they will have some more good luck in the ratings department when all is said and done. The Hollywood Reporter was the first to announce that The Conners Season 2 contract negotiations are currently underway.